Sea swimming races can be a unforgettable experience for open water swimmers, with stunning views of the shore and out to sea. Just ask Keri-anne Payne, who contested the 2016 Olympic 10km race off the iconic Copacabana Beach in Rio with the Christ the Redeemer statue looking down on the swimmers from its lofty perch. But does the fact that you’re swimming in the sea rather than a lake or river change how you approach an open water race? Simply put, yes! There are more differences than you might think. 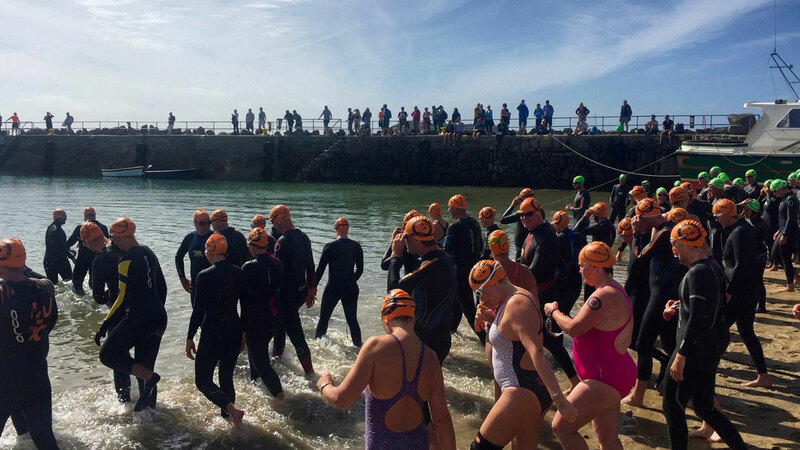 We asked some of the experts at Swim England, as well as Outdoor Swimmer magazine editor Simon Griffiths, to help us compile these eight top tips for sea swimming races. Sea water, because of the salt, is more abrasive than fresh water so your risk of chafing is much higher. If you’re wearing a wetsuit, ensure you use a good wetsuit lubricant around your neck and also consider putting some around your torso and armpits. For non-wetsuit races, a good dollop of Vaseline at key friction points will save you a lot of pain later (between the legs, under your arms and around any costume straps in particular). Men, if you have a bristly chin it can rub your shoulders raw, so smear any contact points with Vaseline. Sea swims are usually choppier than lake or river swims and you also have waves and swell to contend with. You should practise swimming in these conditions before racing in them. Try to keep your stroke and breathing relaxed, even as conditions get more challenging, and remember you may have to sight more often if waves obscure your view. So you’re happily swimming along in front, focusing on tour breathing in the choppy waves and then suddenly you sight and…. where are you? Okay, so if you’re sighting regularly, things shouldn’t get that extreme. But the presence of currents in the sea will need taking into account for your navigation. Sometimes you do have to swim diagonally to keep straight! Like to draft off the swimmers in front, eh? Don’t worry, you’re not the only one because it’s such a great way to conserve energy in a long distance swim. But the bad news is, drafting can be significantly harder in the sea (we mean harder to avoid a foot to the face) because swimmers can be moved around by the waves in rough conditions. Allow a bit more space than you would in a flat lake to avoid unwanted collisions. There is a (small) chance, but it’s not out of the question that you will be stung by a jellyfish in a sea swimming race. In most cases the stings are moderately painful but not dangerous and shouldn’t require you to stop swimming. Just carry on and the pain will recede. However, rarely, some people can suffer an allergic reaction. If you have breathing difficulties or feel dizzy, call for help immediately. Post-swim, the current advice is to treat any stings with warm water. If you’re desperate to an alternative method you’ve heard about (you know what we mean), feel free, but don’t necessarily expect it to help in any way. Of course, this is important wherever you are swimming if it is outdoors. But it’s so important, we thought we’d mention it in this list anyway. Put suncream on before, and immediately after you have dried. Remind anyone watching you to put on suncream. Remind them that even if their bottle says you only need to apply ‘once a day’, they should be topping up. Read some advice on suncream and information on sun exposure here. Remember you can easily become sunburnt while swimming in the sea or on the beach so apply plenty of suncream. If your race starts from a pebbly beach, a pair of flip flops can be useful so you don’t roll an ankle before you’ve even started the race! So unless you’re competing in the Barbados Open Water Festival or at some other glamorous location, the water will be cool. In summer in the UK, the sea is often cooler than inland waters, so ensure you have plenty of warm clothes to put on afterwards if necessary. If race rules allow, then consider wearing two hats and a swimsuit!